For long, humans have been closely associated with Felines. In Ancient Egypt, Cats have played an important role in shaping their history as we know it, also evident in the depiction of their gods and goddesses in the half human and half feline form. Some of the Egyptian gods also have the Canine form, such as Anubis. It is no coincidence that the Sphinx faces the star Sirius, also known as the "Dog Star". Sirius is in the constellation 'Canis Major' or the 'Big Dog', hence the word 'Canine'. The Canines and Felines (Felidae and the Canidae) as we know them are both from Sirius A and exist as fully evolved, crystalline light beings, non physical from our perspective. The household versions of these beings we see on Earth are in fact physical formats, genetically engineered by the Sirians to assist humanity in ways we are just beginning to understand as a species. 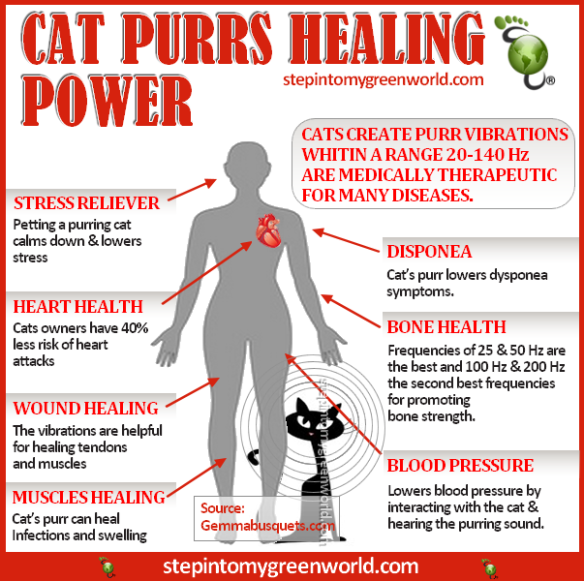 The Cat's purr falls well within the 20-50 hertz anabolic range, and extends up to 140 hertz and is known to assist in bone growth/fracture healing, muscle and tendon repair, pain relief, swelling reduction, dyspnoea (shortness of breath) and to improve mobility of joints. There is also an old veterinary saying which states, " If you put a cat and a bunch of broken bones in the same room, the bones will heal." Cat's purring is often compared to the Dhikr, the rhythmic chanting of the Sufis , which is used in many Islamic hospitals as a healing process. Being around a cat when one is not feeling too well definitely helps as it hastens the healing process. Lying down next to a purring cat when one has a migraine helps one feel better as the healing frequencies alleviate the symptoms and this has been noted in many families which keep cats as pets. If only we had the sensitivity to understand animals and other lifeforms around us, perhaps we would have been a less aggressive species, more in tune with the natural way of life, living in harmony with other members of the Earth Tribe.